Anaface – are you a 10? My avatar got an 8.8 and my RL face got a 7.7. Most of its problems (with both!) were that my nose is too big. But I *like* my nose. Both of my noses, which look nothing alike! 8.85 but I agree with Serene’s comments. 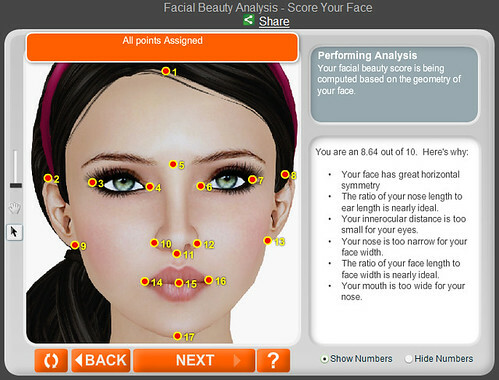 I got an 8.46 and to hell with analysing my own face!! My av got an 8.25 out of 10 & my RL face got an 8.6. What the heck is “poor horizontal symmetry” ? The highest my SL av got was 9.17. I couldn’t find a decent RL pic of me to use, otherwise I would’ve. I’m never looking straight at the camera :S I’m always at least somewhat facing away and it screws up on me when I try with those pics, lol. Hmmm I pulled an 8.64 but interesting to note here is that I hit the back key, redid 17 (chin point) in virtually the same place, did this about 10 times and my score went from 7.53 to 9.01 so definitely not anything exact going on here. We are all 10’s anyways, right ladies!!!! my avatar got a 9.17 and a 8.45 only in rl. I don’t understand why I have poor horizontal symmetry in sl and a good one in rl. Symmetry is 50 in sl. I can’t make it better. Do you have tips? Or it depends of the snapshot?